Just chillin’ in front of Mom’s desk while she blogs. What do y’all think of my chair? I’m in love with it. I knew that I didn’t want a typical office chair so when we saw this baby at Fred Meyer for $99 I swooped it up. I think it’s on sale for $79 now. Damn. 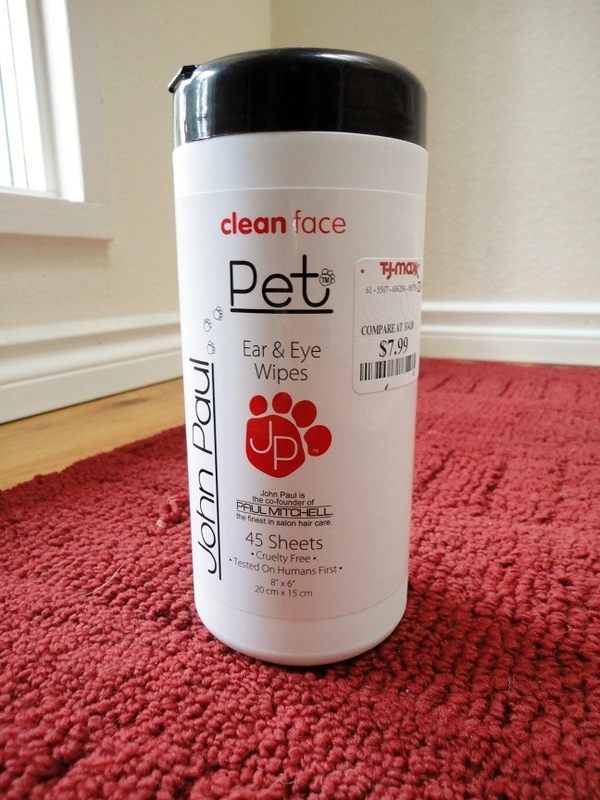 Tonight’s product is John Paul Pet’s Ear and Eye Wipes. 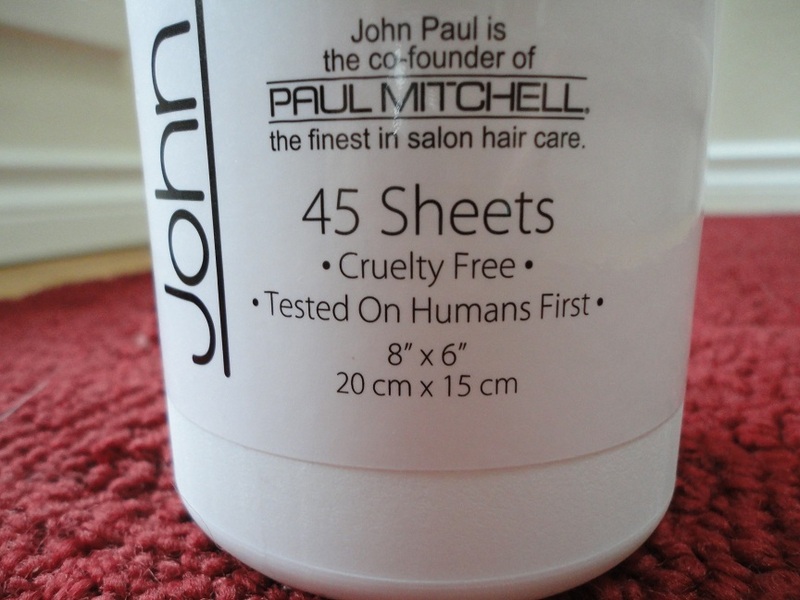 You already know I like John Paul Pet products. We use the Calming Moisturizing Shampoo on Teton once a month and it makes his hair look and feel (and smell, of course) great! But The Little Blogger’s hair isn’t the only thing that needs maintenance. Since he hit the 2-year-old mark he’s been getting a fair amount of gunk in his ears that’s required some cleaning. 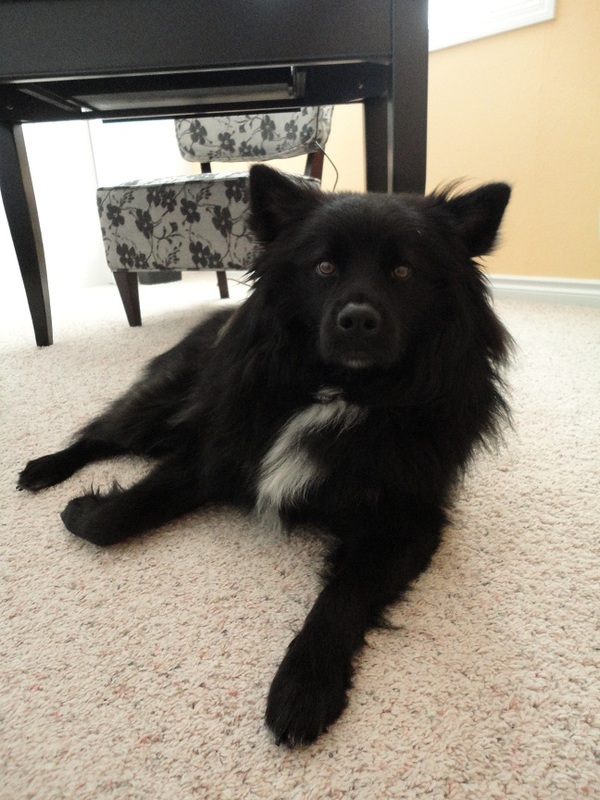 …which required lots of paper towels and made for a very uncomfortable puppy. I think a combination of the time it took to clean Teton’s ears and the wetness from the cleaner itself really drove The Little Blogger nuts. So, I went looking for other options. When I first saw the John Paul Pet Ear and Eye Wipes I winced at the $12 price tag. Sure, it seemed like a good idea, but the bottle of ear cleanser I got cost half that price and would surely last longer. …on a container of the very ear wipes I’d been coveting at TJ Maxx. Score! We’ve been using these wipes ever since and they’re the bees knees. Sure, I wish there were more than 45 wipes per container. And it would be great if they were biodegradable or even flushable. 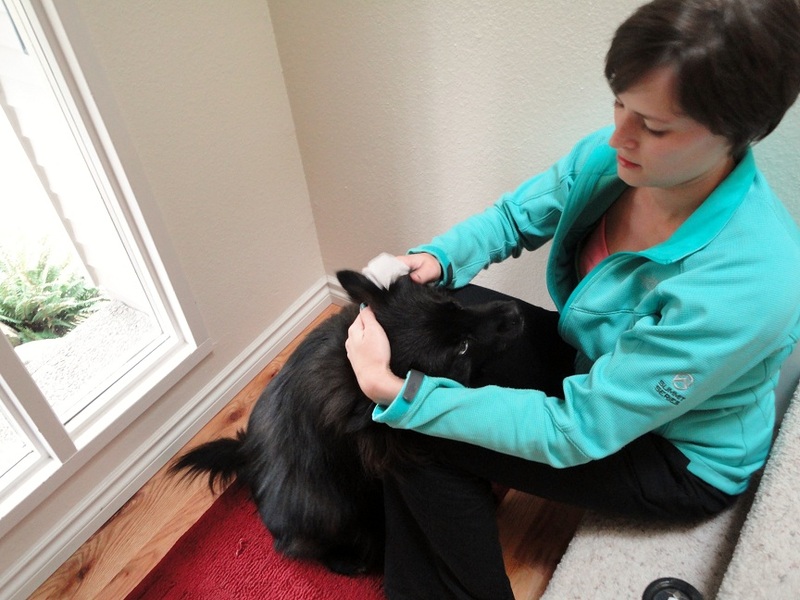 But, Teton doesn’t mind them nearly as much as he did the liquid ear cleaner. Don’t be fooled by these photos. He’s really enjoying his weekly ear cleanse. 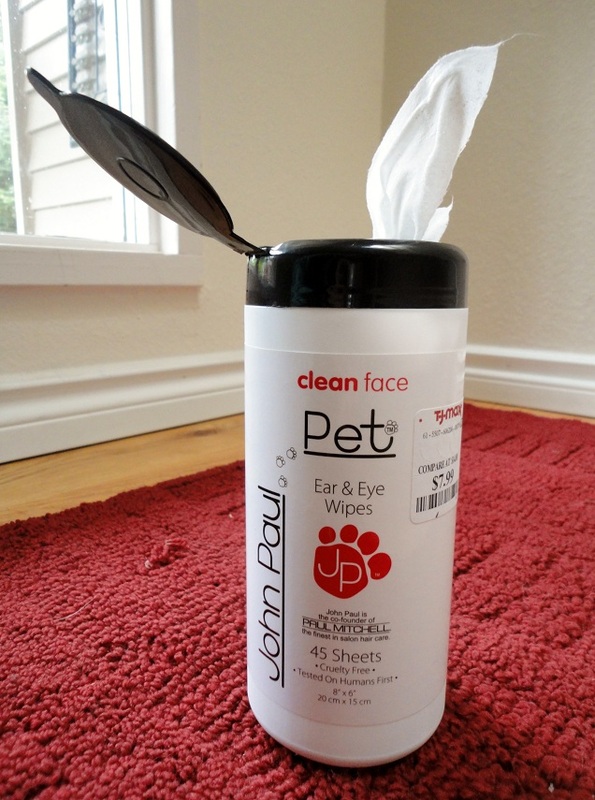 These John Paul Pet Ear and Eye Wipes do the trick, aren’t messy, and are quick and painless to use. Worth their $12 price tag at non-Maxxinista retailers? 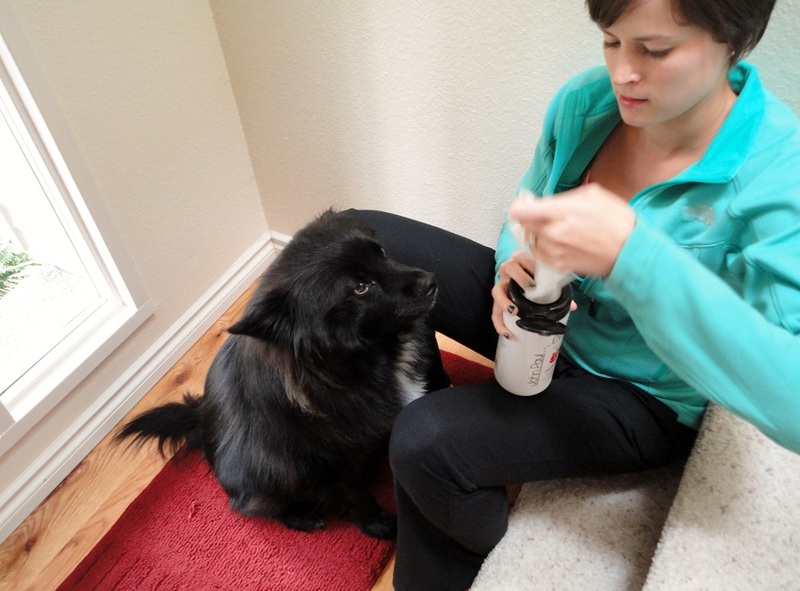 Not if you have multiple dogs or need to clean your pooch’s ears more than a few times a week. 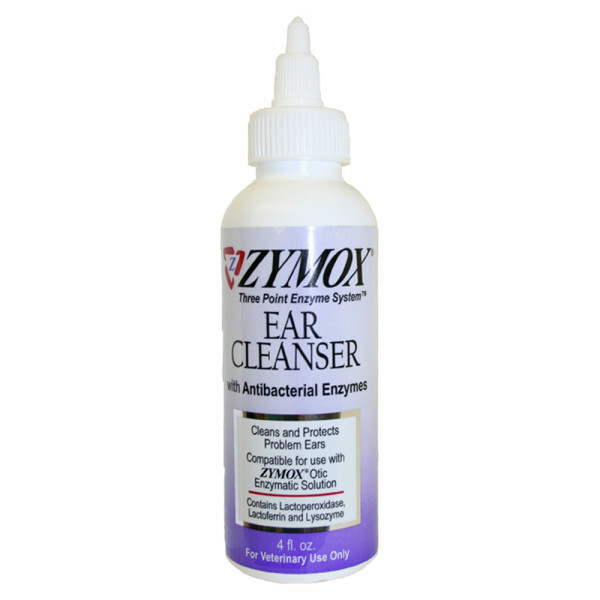 But, if you’re a once-a-week ear cleaner like me, totally worth it! 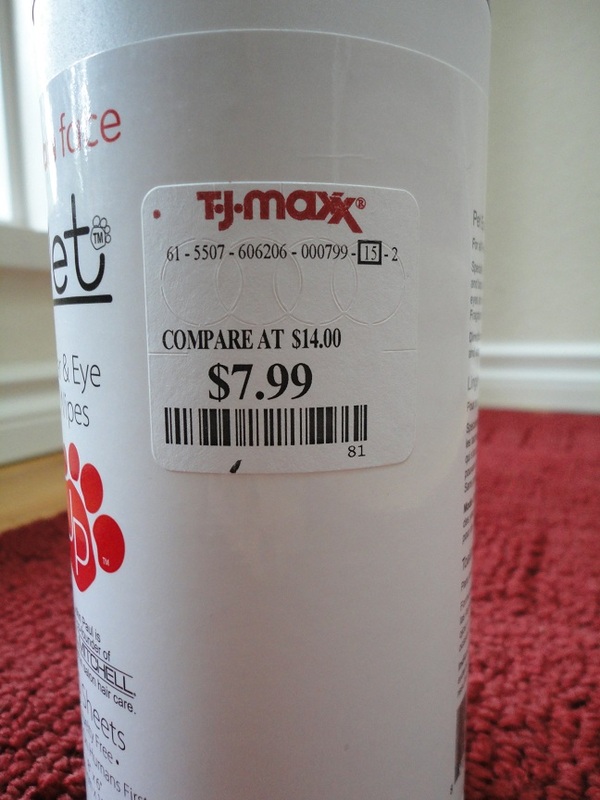 I’ve seen them at TJ Maxx and other “discount” stores since I bought them a few months ago, so I hope to snag them at the $7.99 (or better) price again. We’re out! See you tomorrow instead of Thursday since I’ll be off camping in the great outdoors. Posted on September 13, 2011 by Shannon	This entry was posted in Beauty Parlor. Bookmark the permalink.